I love Medlar. Turn round and walk away now if you’re expecting one of my occasional scathing, sharp tongued rants, this is going to be nothing but an homage to what has incredibly quickly become my favourite London restaurant. Since my first visit towards the end of 2012 I have already returned far more often than the waistband of my jeans would like but its formula of great, relaxed service, perfectly executed food and a delicious, varied wine list makes it irresistible. 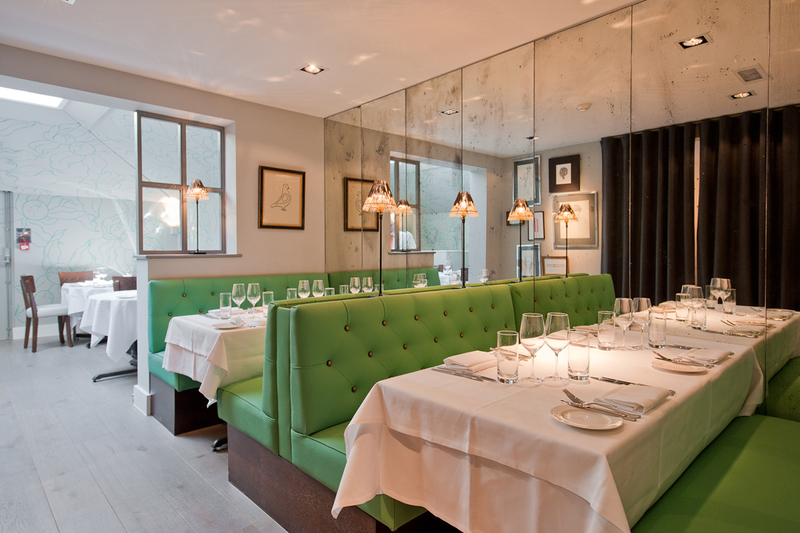 Medlar made an understated but immediately acclaimed entrance into the London food scene in April 2011. Its more public prominence came about when it was awarded its first Michelin star in September 2012. If you were to summarise London food trends in one sentence, 2012 was the year of the super-trendy, starry, young chefs like Ollie Dabbous or Ben Spalding, it was also the year of the hyped up, queue-because-its-worth-it, fast/finger food type restaurants. Not that there’s necessarily anything wrong with this – on the right occasion I love all that stuff- but how nice is it to have a straightforward, good, customer-focused, hype-free South West London restaurant? You know you’re getting long in the tooth when all you want on a night out is to make a booking, know you will arrive at your destination, be seated straight away with a smile, be able to eat your food with a knife and fork and not have to shout at one another. Oh and not having to travel to the depths of east London/Dalston is a bonus. I like the décor very much, the main room has walls in a neutral greeny beige, funky wall lights, art I would stick on my own walls and an age spotted mirrored wall leading through to a light and airy room at the rear . No photo from me unfortunately, those that I took were so excrutiatingly awful I couldn’t post them. I’ve taken the liberty of nicking one from Medlar’s website – hope they don’t mind! I have to admit to being potentially rather biased at this point. I have always been a big fan of both Chez Bruce and The Square however it was only after my first booking that I realised that Medlar is co-owned by David O’Connor (former manager at both CB and the Square) and chef Joe Mercer Nairne. Medlar quite clearly has drawn many inspirations from the Nigel Platts-Martin stable whether at Chez Bruce or the Square. Even the font in the wine list is the same as at Chez Bruce. That said, this is far away from being a carbon copy. Staff are not uniformed and are for the most part quite casual in jeans and pumps. The majority of staff are French despite the English chef/owner partnership and an absolute delight. The atmosphere is more laid back and the menu edgier. The egg tart with ducks hearts is anything but an obvious choice but has found a place on various “best dish in London” lists. Former winner of “Young Sommelier of the Year’, Clement Robert, is a massive asset to the restaurant and has put together one of the best wine lists I have seen in a long time.The list is comprehensive and broad in its appeal. The ‘names’ are well represented from all French regions but more unusual grapes and wine regions also make a welcome appearance. After merrily debating with us the merits of left bank Bordeaux versus right we opted for a 2008 Croix de Gay Pomerol. So good in fact that I’ve spent more time than appropriate searching for it on the internet (and bought a case of 2010 to keep- couldn’t get any 2008 apparently Medlar buy from the same source as me and beat me to it!). On other occasions we have flirted with the Rhone, sampled Austrian white and even Chinese dessert wine (separate post to come on this). We started with a bottle of the house champagne, at £11 a glass or £49 a bottle buying by the glass is less economical so we forced ourselves- it was tough but we survived- to be as efficient as possible on the champagne drinking front and have the whole bottle. So onto the all important bit; the food! Crab raviolo is one of the starters for which Medlar has become known, a signature dish you might say. In fact, follow either the restaurant or David on Twitter and you will occasionally get a running commentary on how many crab raviolos have been served since they opened and we’re into the tens of thousands. Consisting of one very well stuffed and well seasoned raviolo perched in a rich, creamy seafood bisque dotted with tiny curled up brown shrimps, it didn’t fail to impress. Samphire and tomato added an extra dimension and colour. The wild garlic soup with pheasant egg and morels consists of a startlingly bright emerald green soup which has a delicacy of flavour that you wouldn’t expect from something as powerful sounding as a garlic soup. The vibrance of the herbs was balanced by the rich ooze of a soft boiled egg but the stand out ingredient balancing the dish to perfection were the morels, bursting with a gently salted butter gloriousness. Yes folks, it a vegetarian 100% meat free dish and I loved it. What is wrong with me? Talking of well stuffed, portions are a really decent size at Medlar.I don’t generally order lamb, its not my favourite flavour of meat but took a shine to it having a bit of a beef overdose in the preceding week. But oh my days! The highlight beyond highlights of this dish was the humble fondant potato. A caramelised brown, buttery oval of the most meltingly soft potato you can imagine. That said, the under blade fillet of beef with cafe de Paris snails was also pretty amazing. Served with super crunchy, fluffy centred chunky chips and a truly excellent bearnaise sauce; its fine dining spin on the classic steak and chips and utterly delicious. The addition of the lightly curried flavour snails takes the dish from a well executed classic to something new and exciting. My favourite main course, however, (and- dare I say it- the best piggy dish I have ever had) is pork served five ways using Richard Vaughan’s rare breed middle white pork from Huntsham Court Farm. Slices of very slightly pink, succulent pork were accompanied by a peppery, dense, meaty sausage and a chunk of sticky,sweet pork belly. Light, crunchy, puffed up crackling was saved until last in time honoured fashion and was worth the wait. The fifth porcine offering was perhaps my favourites: little deep fried croquettes of tender pulled pork that melted in the mouth. A light jus sauce, cocotte potatoes, runner beans and sweet carrot puree completed my perfect dish. I am passionate about cheese. Ridiculously, inappropriately so. Other than a chunk of parmesan for cooking I don’t keep cheese at home, it’s just far too dangerous, I’d resemble the marshmallow man within weeks. I was therefore really happy with the cheese tray at Medlar. 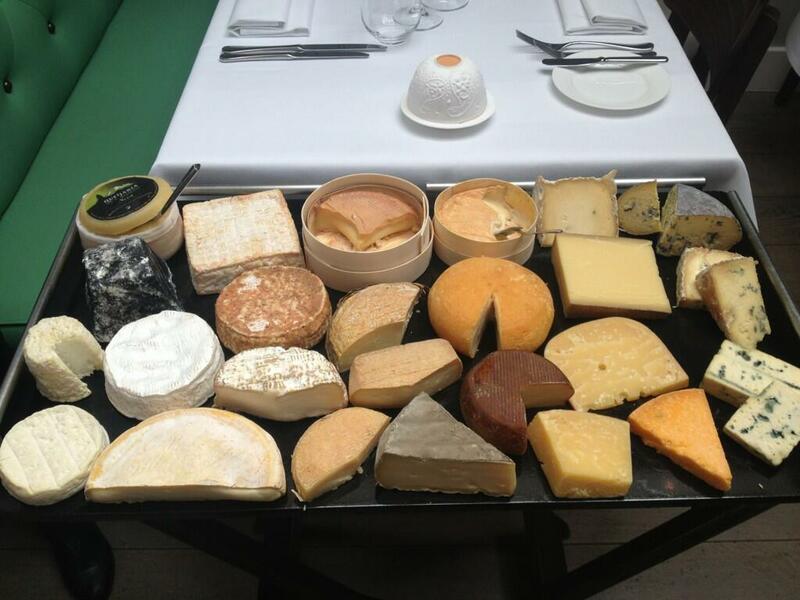 With in excess of twenty cheeses on offer, all tastes are catered for. To ensure the best possible range and quality Medlar source their cheeses from four different suppliers including one which was a new one on me (and the source of my favourite cheese of the evening St Felicien) Bielleville which is near Harrods in Knightsbridge. I also had a 3 year old very sweet, nutty Comte and some Epoisses so runny that it slid around the plate like primeval ooze (in a good way honest!). The creamiest of Brillat Savarin’s you can find and mouth itchingly mature Montgomery contrast with a well balanced, award winning Barkham blue. Pyrenean Bleu des Causses, Livarot, Cropwell Bishop stilton (Paxton & Whitfield), the Who’s Who of cheeses rumbles on. All in all, fantastic cheese. If you’re into goat its all there, just not my bag! I had been umming and ahhing between the chocolate tarte or rhubarb jelly for dessert but after the rich cholesterol cheese hit was relieved I’d gone for the jelly. Ginger granite started off with a lovely delicate flavour that spread into a buzzing warmth much more powerful than its appearance belied. Blood orange sorbet was rich in flavour but light in texture. The jelly itself packed a boozy punch. A really balanced and beautifully conceived dessert that I know I’m going to return to time and time again. I hear, however, that sometimes a tarte tatin makes an appearance on the dessert list. I’m hoping beyond hope that it will be on the menu when I visit one day as it has fans far and wide across London. Pear and almond croustade consists of a wigwam shaped tent parcel of the thinnest filo pastry dusted in sugar that you crunch through to find soft pears and an almond puree. Cocoa nib ice cream balances the pears well, the nibs giving enough of a chocolatey hint without being overpowering. Despite many jokes as to whether the camp ice cream that accompanies cannele comes with sparklers, a feather boa and a Liza Minnelli fanfare, it is delicious, not something I would have expected to enjoy but well matches the rich molten, Congolese chocolate. Every meal is rounded off with cocoa-dusted, soft chocolate truffles that you never think you have space for but somehow always manage it. I make no apologies if this write up borders on the sycophantic. Its hard to countenance using the word “perfect” in relation to any restaurant but there is truly nothing about a Medlar dining experience that I would change. There are rumours in the wind that the owners may be branching out in the future. If any new offering were just an ounce as good as Medlar then they are on to a winning formula. How often is a restaurant so good that you book your next visit before you leave? This one is. Despite the plethora of new places on my wish list in London at the moment I keep going back again and again. See you soon Medlar!